Feel-good therapies and natural healing are the lifestyle mantras of the new millennium. Thailand leads the way in this regard, reviving many of its ancient techniques and treatments that have been handed down from one generation of women to the next. Thai massage and meditation are amongst some of the best in the world, with a full range of services from full beauty treatments, facials, relaxing baths and scrubs, healthy tonics and much more. Plenty of the following Thai Spa traditions have been incorporated into various therapeutic services throughout the world. Their roots can be traced back to the ancient medical knowledge that made their way from India through Buddhist monks.? Thai Herbal Steam is one of the best known of the traditional therapies, tracing its roots back to ancient times. Different healers have formulated specialized treatments to cure various health conditions, but one common after-effect is the fantastic therapeutic effects on your body. Step into a dreamy, misty room and simply lie back and let the steam vapors do their job. For total indulgence combine your herbal steam with a massage – the heat from the steam relaxes your muscles in preparation for a thorough stretch by the masseur! The folks at the popular Tamarind Retreat Steam Bath on the island of Koh Samui claim that their steam treatment aids respiration, relieves sinusitis, bronchial asthma and stimulates circulation. Guests can enjoy alternating bouts of warmth in the steam room and cooling dips in their plunge pool. Tamarind leaves are one of the key ingredients in their herbal steam, with lemongrass, kaffir lime leaves, beach morning glory and many other ingredients completing the set. The origins of the Thai Herbal heat compress are obscure, but they are known to be popular since 200 years ago, and can also be found in neighboring Burma, Cambodia and Laos. The round cotton bundles contains herbal mixtures that vary from region to region, each with their local plants and herbs. These herbal compresses are now packaged and sold commercially in Bangkok, or you can simply create your own with various combinations of herbs. 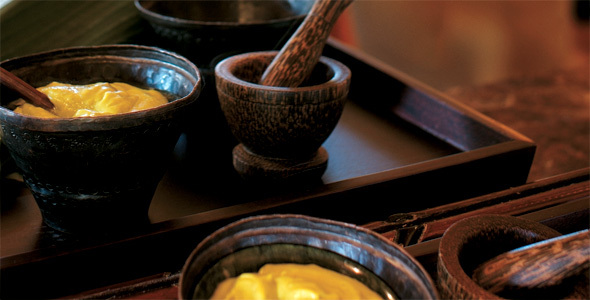 Called prakopin Thai, the herbal compress has made their way into modern spa treatments all over the world, with varying combinations of ingredients. Generally, there are several standard ingredients that can be found inside these herbal compresses, each with their own medical benefits – lemongrass helps clear up the skin; turmeric helps soothe and cleanse irritated skin; prai ginger is a natural moisturizer; and kaffir lime help to tone the skin. These herbal compresses are excellent to soothe sore and aching muscles. To enjoy these refreshing spa treatments to the fullest, you need to find an appropriate setting, one of peace, quiet and relaxation. While it is true that many places in southern Thailand are overcrowded, it is still possible to find a secluded hideaway for some rest and relaxation – check out our top tips for peace and quiet in South Thailand! Thai herbal practitioners have long recognized that the application of heat on the skin enhances the healing effects of herbs. 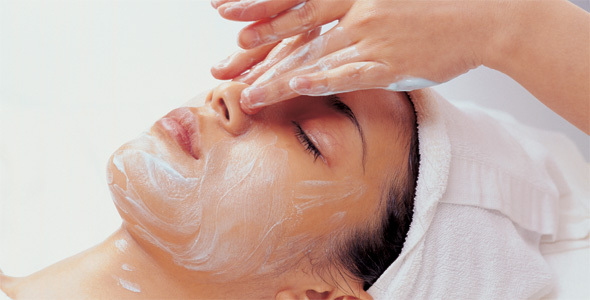 Hence, modern day spas have adapted this concept to create the Thai herbal body wrap. As the body lies in herbal wrap, the combination of heat and herbs takes effect. The heat helps open the pores, allowing for better absorption of the ingredients into the skin, and the herbal wrap works to detoxify, moisturize and soften the skin. Just like other traditional treatments, various herbs combination are used for differing therapeutic benefits. Some of the more common ingredients are – Thai white mud, to help draw out impurities and heal wounds; mint, as antiseptic and antibacterial; tamarind, which contains vitamin C and calcium; honey, to heal and moisturize the skin; and milk, to soften the skin. The tradition of using floral garlands is deeply rooted in Thai culture, a delicate art that has been passed down throughout the generations. Part of every Thai girl’s education consisted of patiently stripping petals from bunches of freshly cut flowers and learning how to make an exquisite garland from them. Jasmine is the main flower used in garlands, with champak, red roses and purple orchids added for visual effects as well as layers of subtle aroma. These favored flowers of Thailand are often used in contemporary spa treatments to add layers of relaxation for the guests. If you are planning a visit to Asia, don’t forget to check out Unearthing Asia, the best Asia travel portal focusing on Lifestyle, Culture and Attractions all over Asia.